It’s time to get serious about summer. 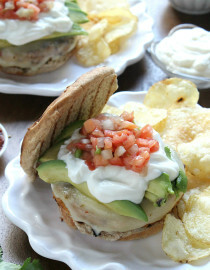 Summer FOOD, specifically, because why else would you be here?! 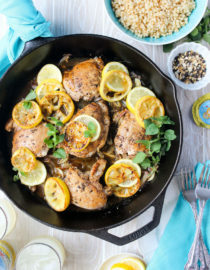 In my little WRY world Memorial Day Weekend isn’t the start of summer, it’s when I start anticipating summer, which for me kicks in around mid-June when I can begin gorging on all the delicious, summertime produce. Till then I remain in a sort of seasonal limbo, so while I wait for my favorite fruits and veggies to begin to peak — tomatoes, strawberries, blueberries, all the good stuff! — my MDW routine tends to follow a basic barbecue scheme: burgers, hot dogs, and a whole bunch of colossal side salads. 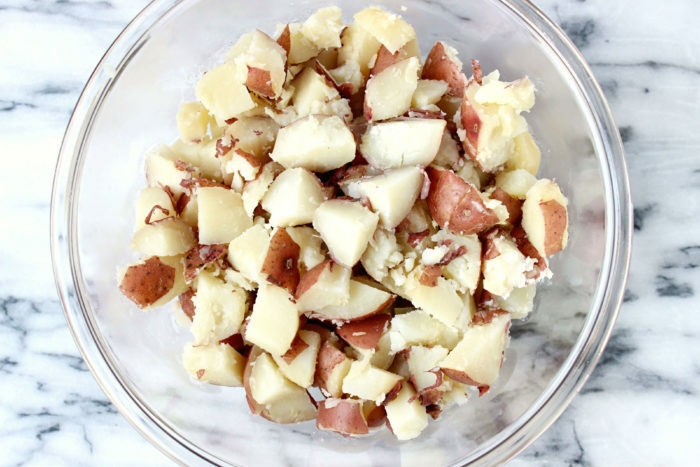 For me, the perfect potato or pasta salad is one completely absent of mayo – There’s just something so hackneyed about the thoughtless merging of white carbs and mayo, I can’t bring myself to do it. So I’ve found ways to mimic mayo’s creaminess in various side salads, last year’s panzanella pasta being a stellar example. 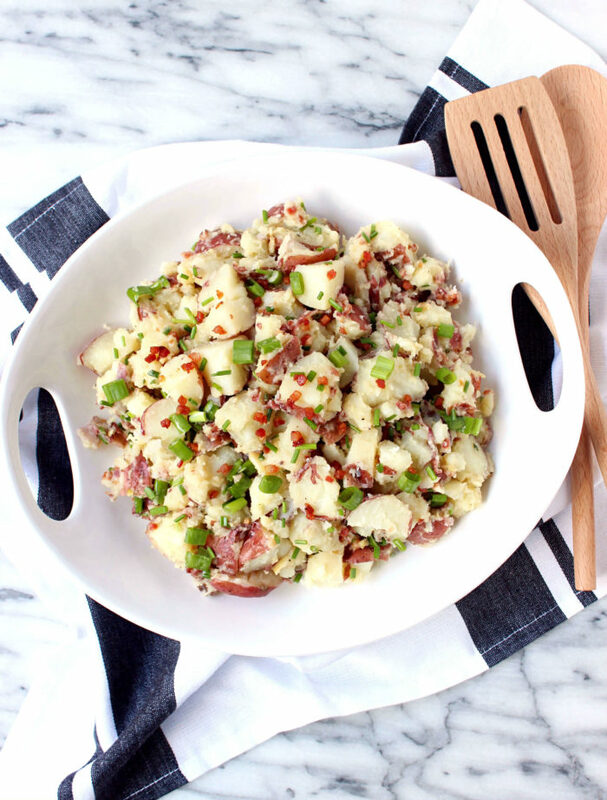 But for this potato salad, the flavor, texture, and unbelieeevable smell is all thanks to one itty, bitty, amazing little ingredient – Roasted garlic. Roasting garlic sounds like an intimidating mess of a process, but it’s actually super simple and lends incredible flavor to just about anything, so it’s worth knowing how to do. The gist is simple enough – cut off the heads of your cloves, peel away as much of the garlic “paper” as you can, then drown the tops in olive oil. Once they’re drenched, wrap ’em tight in foil, roast at 400F for 45 minutes, and voilà! Golden, buttery garlic is right at your fingertips. 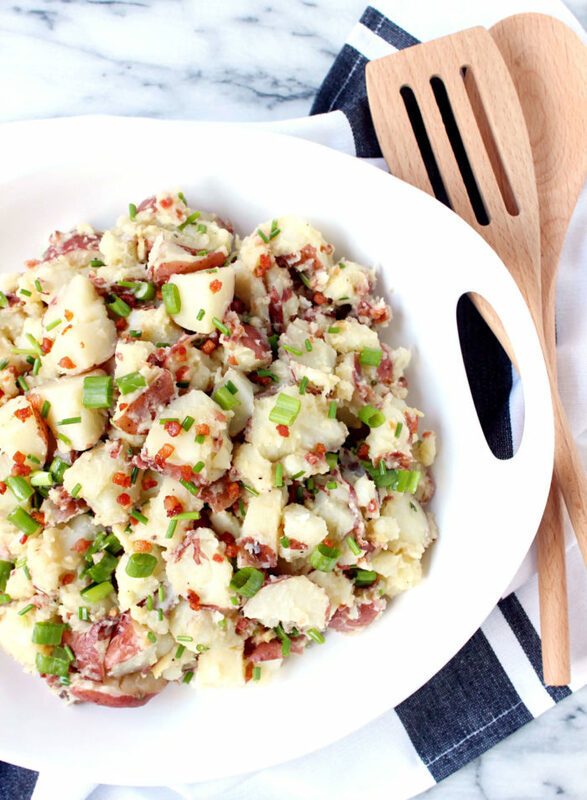 Because the garlic flavor is so delightfully strong, this potato salad doesn’t need much else to shine. I simply mashed up my roasted cloves — and maybe ate a few raw forkfuls, who knows… — then whisked in olive oil, red wine vinegar, and a pinch of salt. 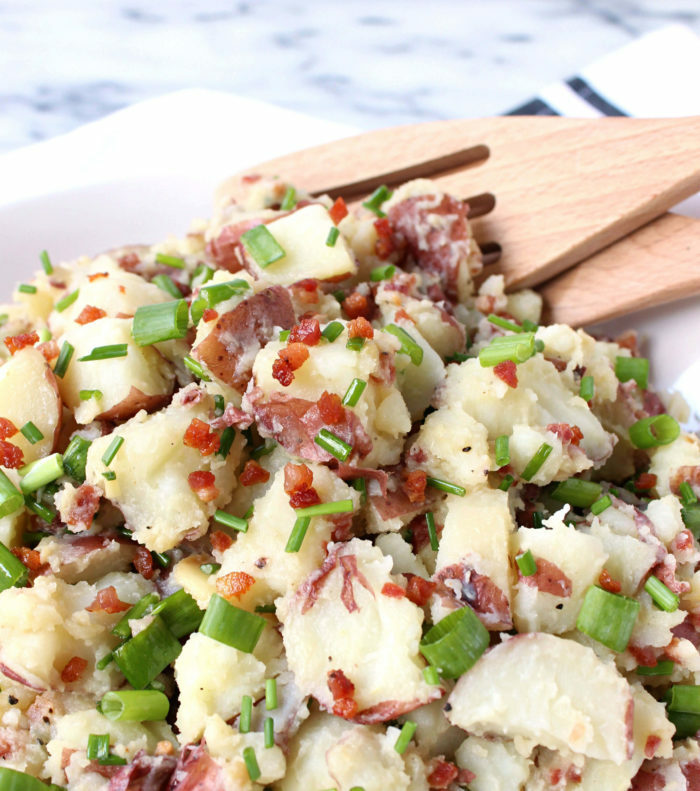 Together this served as my mayo substitute, then I finished things up with diced scallions, chive, and a heaping pile of cubed pancetta, because bacon should be in everything. 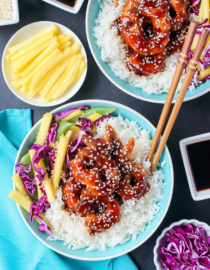 What I love most about this salad is that unlike other bbq sides, this manages to be creamy and indulgent without feeling too heavy – The tang of the red wine vinegar balances out the dominant garlic, and the scallions + chive lend an awesome bite of freshness. Not to mention, the pancetta adds juuust the right touch of salty, fatty flavor, plus a jolt of crispy texture that I can’t help but be a sucker for. Vegans and vegetarians can easily skip the pancetta and/or add in meatless bacon, and if you really wanna go bold and take this from side-dish to main-dish? Soft boiled eggs + crumbled blue cheese will turn this into a cobb-style potato salad, which sounds pretty epic to me. To roast the garlic, slice off the top portion of each garlic head to reveal the cloves. Using your fingers gently rub off most of the paper/peel surrounding the cloves, then pour 1 – 2 tsps EVOO over the head of each bulb. 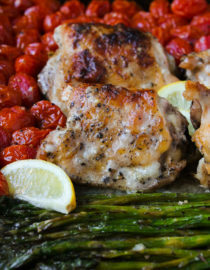 Wrap bulbs tightly in aluminum foil, then transfer to shallow baking sheet. Roast garlic for 45 minutes until cloves are caramely and golden, then set aside to cool. Once the garlic is cooling, bring large pot of salted water to a boil. Add potatoes to boiling water and cover, allowing them to cook for 10-20 minutes until easily pierced through with a fork. * Drain and set aside. 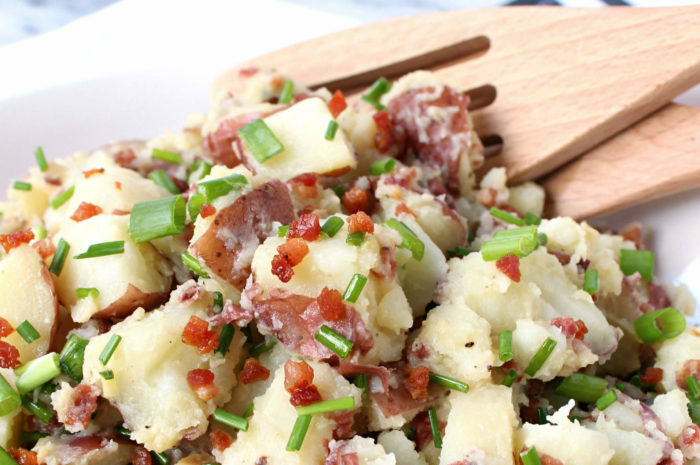 As the potatoes cook, in small skillet brown the pancetta over medium flame until just beginning to crisp, 8 – 10 minutes — since the pancetta is fatty, no greasing is needed. Transfer to paper towel-lined bowl to drain/cool. 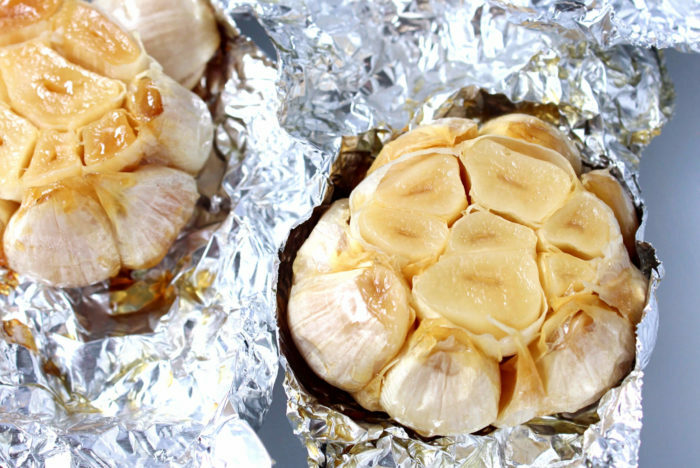 When garlic is cool enough to handle, remove bulbs from foil and squeeze out the cloves into a small bowl. Sprinkle with salt, then gently mash with a fork. Next, add EVOO and red wine vinegar, then whisk until well combined. Once potatoes have cooled (but are still warm! ), roughly cut into quarters before transferring to large mixing dish. Add in garlic sauce, crisped pancetta, scallions, and chive, then toss until well mixed. Immediately plate and serve! * How long the potatoes take to cook will depend on the size of your baby reds – keep an eye on them! 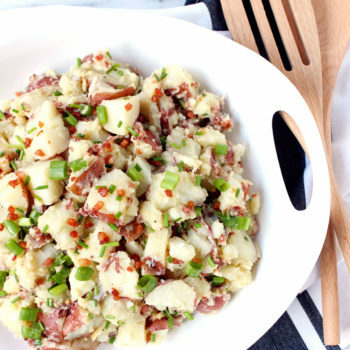 >> Once completed through step 6, potato salad can be kept in refrigerator until needed. Warm to room temperature before serving. 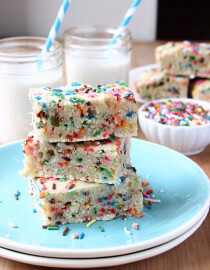 Pinned this immediately but only just got to try the recipe. I am totally speechless about how good this came out. Just wow. This will be my new go-to, for sure.